The Huskies started poorly in the second half and finished worse as they let a double-digit lead slip away and lost their Pac-12 opener 79-74 to Washington State. 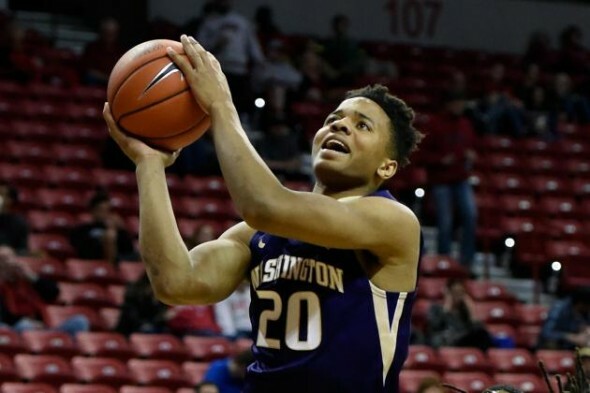 The Washington Huskies fell flat in their Pac-12 Conference men’s conference opener against Washington State University Sunday evening. Despite freshman guard Markelle Fultz nearly reaching the first triple-double in program history, the Huskies let a 13-point first-half lead slip away en route to a 79-74 loss at Hec Edmundson Pavilion. The Huskies had a 71-67 lead in the final three minutes, but couldn’t shore up the defense. Washington State guard Malachi Flynn found the same open slot three times, coming off a ball screen and banking in three layups, including the one that put the Cougars up for good with 0:49 to play. Down the stretch offensively, Washington (7-6, 0-1 Pac-12) came apart, missing four of their final five shots as they snapped a three-game win streak against the Cougars. Coach Lorenzo Romar said his defense didn’t play Flynn according to plan. The stretch was the second breakdown that enabled WSU (8-5, 1-0 Pac-12) to climb back into the game. The first began after Washington held a 38-25 advantage with 4:09 to play in the first half. The Cougars closed on an 8-2 run to intermission. UW’s cold streak continued to start the second period. Washington missed its first six shots, committed five fouls and two turnovers over the first four minutes. The Cougars went on a 14-1 run to take the lead. Romar said the slow start to the second got to his players. Sophomore guard Noah Dickerson said the streak reminded him of the team’s struggles last year. The Cougars capitalized on their size. Senior forward Josh Hawkinson put his 6-foot-10 frame to use, scoring 26 points and grabbing eight rebounds on the back of a 10-of-18 shooting performance. Center Conor Clifford added 14, helping Washington State finish with a 44-30 advantage in points in the paint. As has been the case all season, Fultz was the highlight for the Huskies. The freshman was 11-of-26 from the field for 26 points, plus a career-high 11 assists and nine rebounds while committing six turnovers. Dickerson added 19 points, while David Crisp scored 11. Washington hosts No. 21 Oregon Wednesday (6 p.m., ESPN2). The 13-2 Ducks knocked the Huskies out of the Pac-12 tournament in the first round last year. Nice win for the Cougs, Cougar Nation needed this from the MBB. No player has had a triple double in program history? Wow, with all the great players they’ve had, that’s surprising. Romar and his AAU style of play means ANOTHER disappointing season despite having NBA talent. Get used to it. Oh wait, we already have. Fultz – One and done. The time is now for UW to make a coaching change. A decent or semi decent coach could take this team to the tourney. Romar cant even beat the cougars. Sick of his style of coaching, getting one and done players. Nice guys finish last, and that is where we will be if we keep him.